Freeport, Grand Bahama Island - The Grand Bahama Performing Arts Society is pleased to present international recording artists Naturally 7 on May 1st and 2nd, 2010. Naturally 7 will perform live in concert Saturday, May 1st on Grand Bahama Island and will conduct an inspiring meet, greet and mentor workshop for children 13 –18 years of age on Sunday, May 2nd 2010. Naturally 7 is an American male music group a Capella style (voice only - no instruments) who perform what they call "Vocal Play" ( each of them used their voices in unison to recreate a different musical instrument from drums to brass instruments to guitars) . They sing primarily R & B with extensive beat boxing (vocal percussion) . 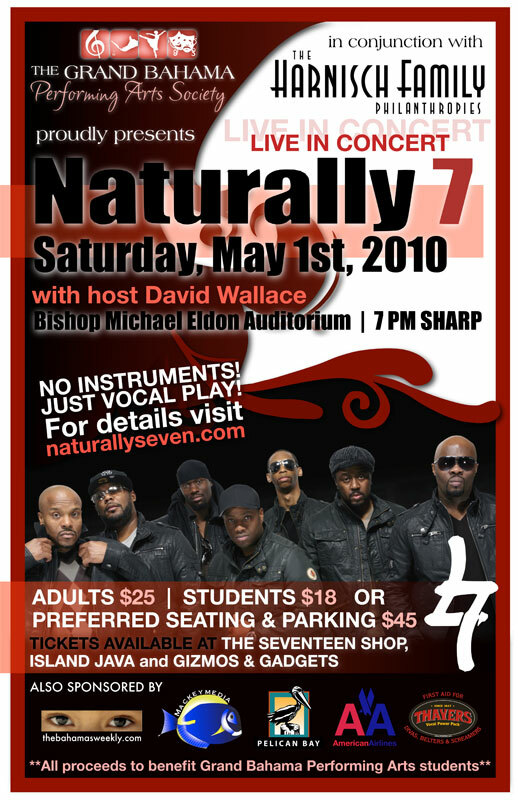 Naturally 7 band members are Roger Thomas (musical director, arranger, 1st Baritone, Rap), Warren Thomas (percussion, guitar, clarinet, 3rd tenor) Rod Eldridge (1st tenor, scratching, trumpet), Jamal Reed (4th Tenor, electric guitar), Dwight Stewart (2nd baritone), Garfield Buckley (2nd Tenor, Harmonica) and “Hops” Hutton (Bass).